OK. As you can see and read , I’m back using my router, again. This week I worked on the hood for the tall clocks I’m building. These clocks have a small windows set into both sides of the hoods that make it easy to see the movement inside – it was a big deal, back in the day, to have high-style brass movements and owners wanted to boast of their wealth. To install these windows, I lay out the locations and size, drill an access hole large enough to pass a jigsaw blade through then rough cut the opening staying away from my lines. With the hole cut, the opening needs to be cleaned up and squared. 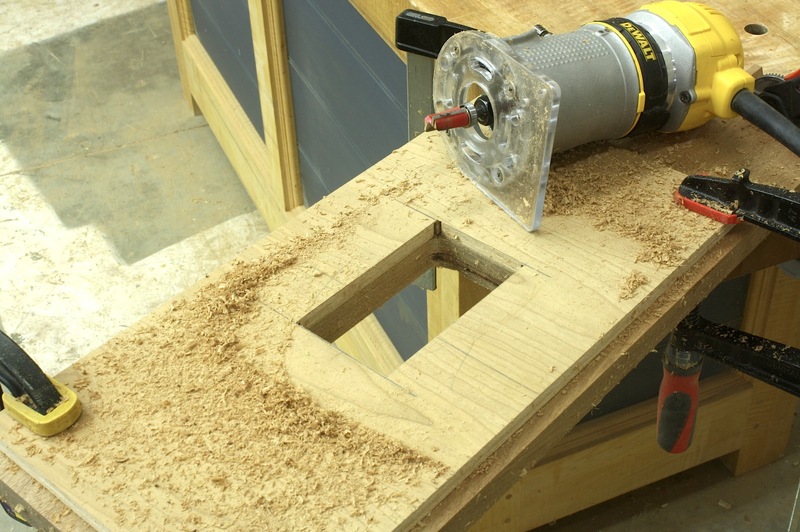 For this I construct a shop-made jig to guide my router and top-mount-bearing router bit. 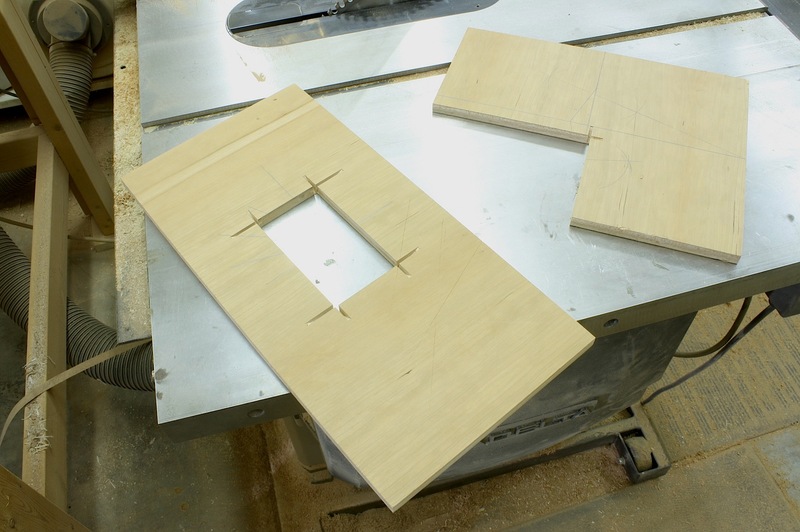 Even though one design is easier to make, both of these jigs can be produced in short order. Take a look at the back faces of the jigs (left). See the over-cut lines? 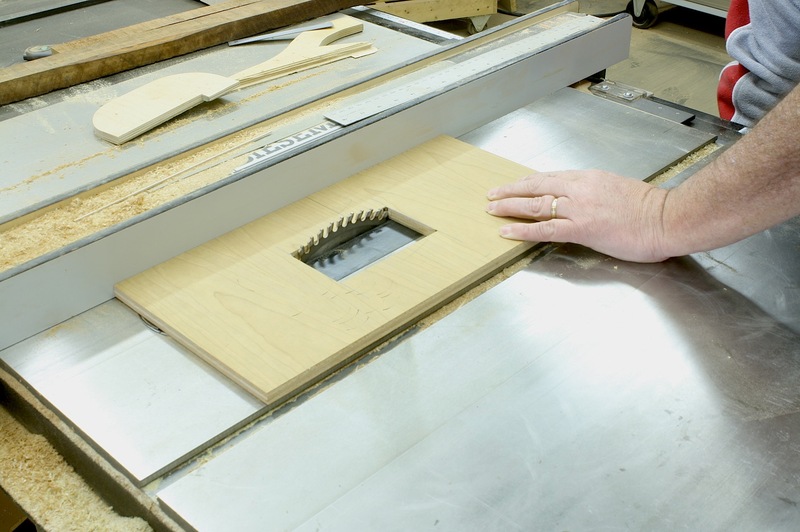 These jigs are quick to make using your table saw. 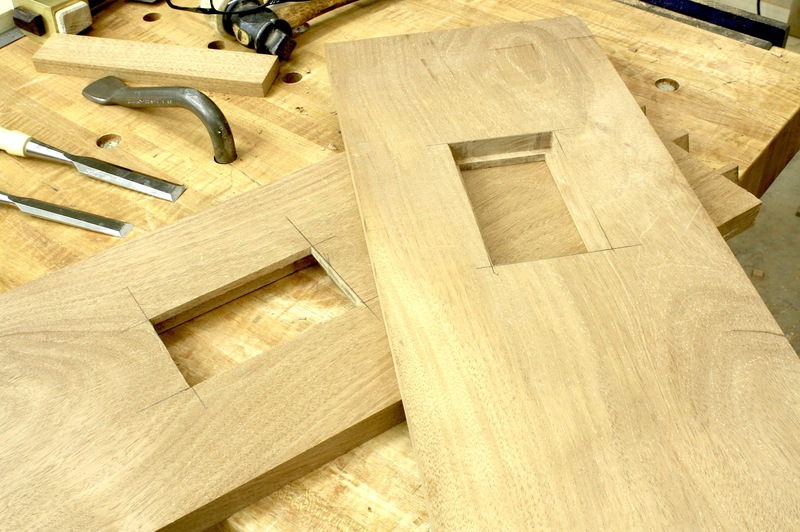 With the L-shaped jig, it’s simply two cuts and it’s done. That’s too easy. 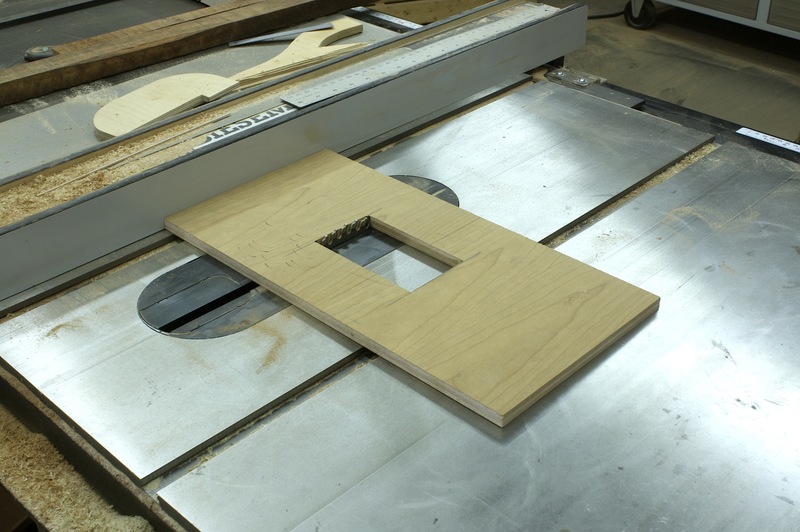 The one-setup jig takes a bit more time, but it is also easy to make. To begin, choose your material. For either of these jigs, I’m partial to plywood. It’s rigid and will not break if you drop it (most times). And it will not move as the seasons change. The operation is the same when cutting the ends of your jig layout. The last cut frees the waste in the opening. If you go slow that should not be a problem. But to be on the safe side, add a piece of tape over the waste so your blade doesn’t kick it up. 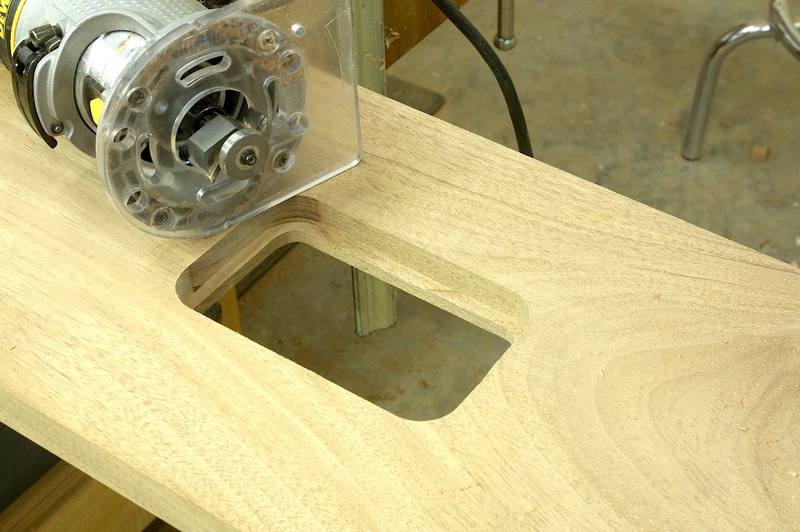 To use the jig, clamp it over the jigsaw-cutout area at your lines, and run your router around the jig with the bearing riding the jig’s edges. Because you are inside the cut, run clockwise as your work. My router bit leaves a bit to be desired as shown by the burns in my workpiece and the nicks in the carbide. (It still works, though.) I can get by with this for two reasons. One, no one will ever see the burn area after the glass is installed. And two, most of the toasted fibers are removed as I rabbet for the glass (shown below, left). Of course, you do need to square the corners of the rabbeted area and of the show side of the hood opening. Sharp chisels are a must for paring the end grain inside the rabbet (keep the sides set at 90 degrees), but to clean up my opening corners, I use a Japanese flush-cut saw and fine rasp. Work slow to keep the four edges of your opening straight. It’s easy to round, or otherwise bugger up, the corners.